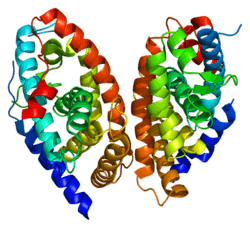 Retinoic acid receptor alpha (RAR-α), also known as NR1B1 (nuclear receptor subfamily 1, group B, member 1) is a nuclear receptor that in humans is encoded by the RARA gene. Retinoid signaling is transduced by 2 families of nuclear receptors, retinoic acid receptor (RAR) and retinoid X receptor (RXR), which form RXR/RAR heterodimers. In the absence of ligand, DNA-bound RXR/RARA represses transcription by recruiting the corepressors NCOR1, SMRT (NCOR2), and histone deacetylase. When ligand binds to the complex, it induces a conformational change allowing the recruitment of coactivators, histone acetyltransferases, and the basic transcription machinery. Translocations that always involve rearrangement of the RARA gene are a cardinal feature of acute promyelocytic leukemia (APL; MIM 612376). The most frequent translocation is t(15,17)(q21;q22), which fuses the RARA gene with the PML gene. ↑ "Drugs that physically interact with Retinoic acid receptor alpha view/edit references on wikidata". ↑ Giguere V, Ong ES, Segui P, Evans RM (1987). "Identification of a receptor for the morphogen retinoic acid". Nature. 330 (6149): 624–9. doi:10.1038/330624a0. PMID 2825036. ↑ Anderson LA, Friedman L, Osborne-Lawrence S, Lynch E, Weissenbach J, Bowcock A, King MC (September 1993). "High-density genetic map of the BRCA1 region of chromosome 17q12-q21". Genomics. 17 (3): 618–23. doi:10.1006/geno.1993.1381. PMID 8244378. ↑ "Entrez Gene: retinoic acid receptor". ↑ Vitoux D, Nasr R, de The H (2007). "Acute promyelocytic leukemia: new issues on pathogenesis and treatment response". Int. J. Biochem. Cell Biol. 39 (6): 1063–70. doi:10.1016/j.biocel.2007.01.028. PMID 17468032. ↑ Liu R, Takayama S, Zheng Y, Froesch B, Chen GQ, Zhang X, Reed JC, Zhang XK (July 1998). "Interaction of BAG-1 with retinoic acid receptor and its inhibition of retinoic acid-induced apoptosis in cancer cells". J. Biol. Chem. 273 (27): 16985–92. doi:10.1074/jbc.273.27.16985. PMID 9642262. 1 2 McNamara P, Seo SB, Rudic RD, Sehgal A, Chakravarti D, FitzGerald GA (June 2001). "Regulation of CLOCK and MOP4 by nuclear hormone receptors in the vasculature: a humoral mechanism to reset a peripheral clock". Cell. 105 (7): 877–89. doi:10.1016/S0092-8674(01)00401-9. PMID 11439184. ↑ Despouy G, Bastie JN, Deshaies S, Balitrand N, Mazharian A, Rochette-Egly C, Chomienne C, Delva L (February 2003). "Cyclin D3 is a cofactor of retinoic acid receptors, modulating their activity in the presence of cellular retinoic acid-binding protein II". J. Biol. Chem. 278 (8): 6355–62. doi:10.1074/jbc.M210697200. PMID 12482873. ↑ Lee SK, Jung SY, Kim YS, Na SY, Lee YC, Lee JW (February 2001). "Two distinct nuclear receptor-interaction domains and CREB-binding protein-dependent transactivation function of activating signal cointegrator-2". Mol. Endocrinol. 15 (2): 241–54. doi:10.1210/me.15.2.241. PMID 11158331. ↑ Lee SK, Anzick SL, Choi JE, Bubendorf L, Guan XY, Jung YK, Kallioniemi OP, Kononen J, Trent JM, Azorsa D, Jhun BH, Cheong JH, Lee YC, Meltzer PS, Lee JW (November 1999). "A nuclear factor, ASC-2, as a cancer-amplified transcriptional coactivator essential for ligand-dependent transactivation by nuclear receptors in vivo". J. Biol. Chem. 274 (48): 34283–93. doi:10.1074/jbc.274.48.34283. PMID 10567404. ↑ Guidez F, Ivins S, Zhu J, Söderström M, Waxman S, Zelent A (April 1998). "Reduced retinoic acid-sensitivities of nuclear receptor corepressor binding to PML- and PLZF-RARalpha underlie molecular pathogenesis and treatment of acute promyelocytic leukemia". Blood. 91 (8): 2634–42. PMID 9531570. ↑ Dong S, Tweardy DJ (April 2002). "Interactions of STAT5b-RARalpha, a novel acute promyelocytic leukemia fusion protein, with retinoic acid receptor and STAT3 signaling pathways". Blood. 99 (8): 2637–46. doi:10.1182/blood.V99.8.2637. PMID 11929748. ↑ Hong SH, David G, Wong CW, Dejean A, Privalsky ML (August 1997). "SMRT corepressor interacts with PLZF and with the PML-retinoic acid receptor alpha (RARalpha) and PLZF-RARalpha oncoproteins associated with acute promyelocytic leukemia". Proc. Natl. Acad. Sci. U.S.A. 94 (17): 9028–33. doi:10.1073/pnas.94.17.9028. PMC 23013 . PMID 9256429. ↑ Hu X, Chen Y, Farooqui M, Thomas MC, Chiang CM, Wei LN (January 2004). "Suppressive effect of receptor-interacting protein 140 on coregulator binding to retinoic acid receptor complexes, histone-modifying enzyme activity, and gene activation". J. Biol. Chem. 279 (1): 319–25. doi:10.1074/jbc.M307621200. PMID 14581481. ↑ Farooqui M, Franco PJ, Thompson J, Kagechika H, Chandraratna RA, Banaszak L, Wei LN (February 2003). "Effects of retinoid ligands on RIP140: molecular interaction with retinoid receptors and biological activity". Biochemistry. 42 (4): 971–9. doi:10.1021/bi020497k. PMID 12549917. ↑ L'Horset F, Dauvois S, Heery DM, Cavaillès V, Parker MG (November 1996). "RIP-140 interacts with multiple nuclear receptors by means of two distinct sites". Mol. Cell. Biol. 16 (11): 6029–36. PMC 231605 . PMID 8887632. ↑ Seol W, Hanstein B, Brown M, Moore DD (October 1998). "Inhibition of estrogen receptor action by the orphan receptor SHP (short heterodimer partner)". Mol. Endocrinol. 12 (10): 1551–7. doi:10.1210/me.12.10.1551. PMID 9773978. ↑ Perlmann T, Jansson L (April 1995). "A novel pathway for vitamin A signaling mediated by RXR heterodimerization with NGFI-B and NURR1". Genes Dev. 9 (7): 769–82. doi:10.1101/gad.9.7.769. PMID 7705655. ↑ Zhong S, Delva L, Rachez C, Cenciarelli C, Gandini D, Zhang H, Kalantry S, Freedman LP, Pandolfi PP (November 1999). "A RA-dependent, tumour-growth suppressive transcription complex is the target of the PML-RARalpha and T18 oncoproteins". Nat. Genet. 23 (3): 287–95. doi:10.1038/15463. PMID 10610177. ↑ Benkoussa M, Brand C, Delmotte MH, Formstecher P, Lefebvre P (July 2002). "Retinoic acid receptors inhibit AP1 activation by regulating extracellular signal-regulated kinase and CBP recruitment to an AP1-responsive promoter". Mol. Cell. Biol. 22 (13): 4522–34. doi:10.1128/MCB.22.13.4522-4534.2002. PMC 133906 . PMID 12052862. ↑ Bugge TH, Pohl J, Lonnoy O, Stunnenberg HG (April 1992). "RXR alpha, a promiscuous partner of retinoic acid and thyroid hormone receptors". EMBO J. 11 (4): 1409–18. PMC 556590 . PMID 1314167. ↑ Kim HJ, Yi JY, Sung HS, Moore DD, Jhun BH, Lee YC, Lee JW (September 1999). "Activating signal cointegrator 1, a novel transcription coactivator of nuclear receptors, and its cytosolic localization under conditions of serum deprivation". Mol. Cell. Biol. 19 (9): 6323–32. doi:10.1128/mcb.19.9.6323. PMC 84603 . PMID 10454579. ↑ Zeng M, Kumar A, Meng G, Gao Q, Dimri G, Wazer D, Band H, Band V (November 2002). "Human papilloma virus 16 E6 oncoprotein inhibits retinoic X receptor-mediated transactivation by targeting human ADA3 coactivator". J. Biol. Chem. 277 (47): 45611–8. doi:10.1074/jbc.M208447200. PMID 12235159. ↑ Martin PJ, Delmotte MH, Formstecher P, Lefebvre P (September 2003). "PLZF is a negative regulator of retinoic acid receptor transcriptional activity". Nucl. Recept. 1 (1): 6. doi:10.1186/1478-1336-1-6. PMC 212040 . PMID 14521715. Petkovich M, Brand NJ, Krust A, Chambon P (1988). "A human retinoic acid receptor which belongs to the family of nuclear receptors". Nature. 330 (6147): 444–50. doi:10.1038/330444a0. PMID 2825025. Sirulnik A, Melnick A, Zelent A, Licht JD (2003). "Molecular pathogenesis of acute promyelocytic leukaemia and APL variants". Best Pract Res Clin Haematol. 16 (3): 387–408. doi:10.1016/S1521-6926(03)00062-8. PMID 12935958. Kliewer SA, Umesono K, Mangelsdorf DJ, Evans RM (1992). "Retinoid X receptor interacts with nuclear receptors in retinoic acid, thyroid hormone and vitamin D3 signalling". Nature. 355 (6359): 446–9. doi:10.1038/355446a0. PMID 1310351. Kastner P, Perez A, Lutz Y, Rochette-Egly C, Gaub MP, Durand B, Lanotte M, Berger R, Chambon P (1992). "Structure, localization and transcriptional properties of two classes of retinoic acid receptor alpha fusion proteins in acute promyelocytic leukemia (APL): structural similarities with a new family of oncoproteins". EMBO J. 11 (2): 629–42. PMC 556495 . PMID 1311253. Baniahmad A, Köhne AC, Renkawitz R (1992). "A transferable silencing domain is present in the thyroid hormone receptor, in the v-erbA oncogene product and in the retinoic acid receptor". EMBO J. 11 (3): 1015–23. PMC 556542 . PMID 1347744.
de Thé H, Lavau C, Marchio A, Chomienne C, Degos L, Dejean A (1991). "The PML-RAR alpha fusion mRNA generated by the t(15;17) translocation in acute promyelocytic leukemia encodes a functionally altered RAR". Cell. 66 (4): 675–84. doi:10.1016/0092-8674(91)90113-D. PMID 1652369.
de Thé H, Chomienne C, Lanotte M, Degos L, Dejean A (1990). "The t(15;17) translocation of acute promyelocytic leukaemia fuses the retinoic acid receptor alpha gene to a novel transcribed locus". Nature. 347 (6293): 558–61. doi:10.1038/347558a0. PMID 2170850. Brand NJ, Petkovich M, Chambon P (1990). "Characterization of a functional promoter for the human retinoic acid receptor-alpha (hRAR-alpha)". Nucleic Acids Res. 18 (23): 6799–806. doi:10.1093/nar/18.23.6799. PMC 332734 . PMID 2175878. Borrow J, Goddard AD, Sheer D, Solomon E (1990). "Molecular analysis of acute promyelocytic leukemia breakpoint cluster region on chromosome 17". Science. 249 (4976): 1577–80. doi:10.1126/science.2218500. PMID 2218500. Arveiler B, Petkovich M, Mandel JL, Chambon P (1988). "A PstI RFLP for the human retinoic acid receptor in 17q21". Nucleic Acids Res. 16 (13): 6252. doi:10.1093/nar/16.13.6252. PMC 336887 . PMID 2899875. Chen JD, Evans RM (1995). "A transcriptional co-repressor that interacts with nuclear hormone receptors". Nature. 377 (6548): 454–7. doi:10.1038/377454a0. PMID 7566127. Fisher GJ, Talwar HS, Xiao JH, Datta SC, Reddy AP, Gaub MP, Rochette-Egly C, Chambon P, Voorhees JJ (1994). "Immunological identification and functional quantitation of retinoic acid and retinoid X receptor proteins in human skin". J. Biol. Chem. 269 (32): 20629–35. PMID 8051161. Chen Z, Guidez F, Rousselot P, Agadir A, Chen SJ, Wang ZY, Degos L, Zelent A, Waxman S, Chomienne C (1994). "PLZF-RAR alpha fusion proteins generated from the variant t(11;17)(q23;q21) translocation in acute promyelocytic leukemia inhibit ligand-dependent transactivation of wild-type retinoic acid receptors". Proc. Natl. Acad. Sci. U.S.A. 91 (3): 1178–82. doi:10.1073/pnas.91.3.1178. PMC 521477 . PMID 8302850. Redner RL, Rush EA, Faas S, Rudert WA, Corey SJ (1996). "The t(5;17) variant of acute promyelocytic leukemia expresses a nucleophosmin-retinoic acid receptor fusion". Blood. 87 (3): 882–6. PMID 8562957. Kamei Y, Xu L, Heinzel T, Torchia J, Kurokawa R, Gloss B, Lin SC, Heyman RA, Rose DW, Glass CK, Rosenfeld MG (1996). "A CBP integrator complex mediates transcriptional activation and AP-1 inhibition by nuclear receptors". Cell. 85 (3): 403–14. doi:10.1016/S0092-8674(00)81118-6. PMID 8616895. Liu W, Hellman P, Li Q, Yu WR, Juhlin C, Nordlinder H, Rollman O, Akerström G, Törmä H, Melhus H (1996). "Biosynthesis and function of all-trans- and 9-cis-retinoic acid in parathyroid cells". Biochem. Biophys. Res. Commun. 229 (3): 922–9. doi:10.1006/bbrc.1996.1903. PMID 9005841. Thénot S, Henriquet C, Rochefort H, Cavaillès V (1997). "Differential interaction of nuclear receptors with the putative human transcriptional coactivator hTIF1". J. Biol. Chem. 272 (18): 12062–8. doi:10.1074/jbc.272.18.12062. PMID 9115274.